Score available for sale (496-00015); orchestral parts on rental. NIGHT RIVERS, SYMPHONY NO. 3 was commissioned by the Michigan Council for the Arts and premiered by the Plymouth Symphony Orchestra on November 13, 1992 with the composer conducting. It is recorded on Albany Records TROY 486 by the Janacek Philharmonic conducted by the composer, and also on the Vienna Modern Masters CD VMM 3019 by the Krakow Radio Symphony conducted by José Maria Florêncio. Walt Whitman’s mystical image of life-flow (river) is latent in the opening bars of NIGHT RIVERS, in the form of a dreamlike tremolo figure that later becomes a continuous rhythmic flow. Whitman’s mysterious realm of death and rebirth (night) is suggested by the sound that begins the piece, a sustained low D which swells in volume, suddenly diminishes to a whisper, and slowly becomes part of a four-note descending motive, a seminal figure for the entire symphony. NIGHT RIVERS is ultimately a work of movement and repose. It is a symphony whose principal musical figures, both dark and light, shadowy and bold, were inspired by Whitman’s metaphors for journey and rebirth in a spiritual realm. The composer’s rivers of musical energy separate and collide in layered textures at several structural high points, only to reunite again in cycles of repose, where the flow of musical energy is transfigured and refined into a rainbow of static melodic planes of complementary colors. ​ "His craft reaches its zenith in...the Two-Piano Inventions, which won the SAI/C.F. Peters competition in 1990, and the Third Symphony; in both these works, organic growth inspires music of great strength and formal clarity, as opening bars generate the textural and thematic contours that forge contrasting sections of reflection and cross-rhythmic dynamism." 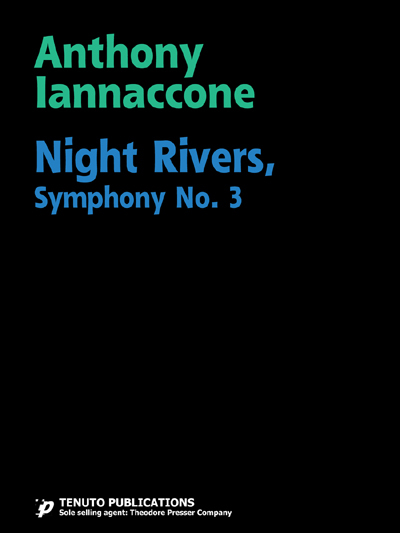 "I can't be more direct: Night Rivers (1990-92), the Third Symphony of Anthony Iannaccone is stunning - a rare work that achieves a dramatic balance of the cerebral and visceral. To my mind, it is one of the supreme American symphonies. ...After listening to Night Rivers frequently over the past four years and never failing to be enthralled by the insights of its argument and development, I have been moved to submit a "Hall of Fame" review for only the second time. ...Somehow, even in its fortissimo parts, the Symphony retains an aura of misterioso. The music's sonic diversity and ensembling of colors are masterful, and its progression toward a conclusion, even in its more-or-less static passages, keeps the listener enthralled hearing after hearing. And not since George Rochberg's quite different Symphony No. 2 - a neglected masterpiece... do I remember being so convinced by a symphony's quiet ending as I am by that of Night Rivers. "Michigan composer Anthony Iannaccone was set to conduct his new symphony Night Rivers for the first time, before a sizable audience. ...Inspired in part by Walt Whitman's metaphorical use of the word "river" and "night," [Night Rivers] explores the spiritual qualities of motion as a journey through the tumult of life onto death and then rebirth. The piece is breathtaking...Although Night Rivers does not engage straightforward melodies, its chilling, swirling theme is unforgettable and deeply touching." 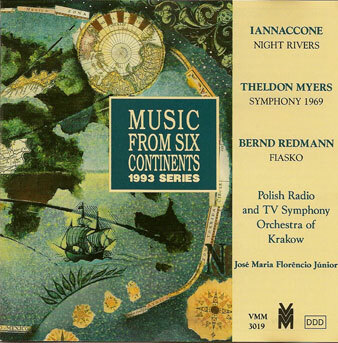 "Anthony Iannaccone's tremendous third symphony (1992) [is my other] favorite “unknown” symphony of the 1990s, and is music that deserves to be widely played." "...an organicism pervades the music [of Iannaccone’s third symphony] that holds together all the disparate elements in a unique way … powerful, driving lines literally had me leaning forward in my chair."